Considered a classic Pinoy dessert, cassava cake is a popular delicacy and has several versions throughout the country. 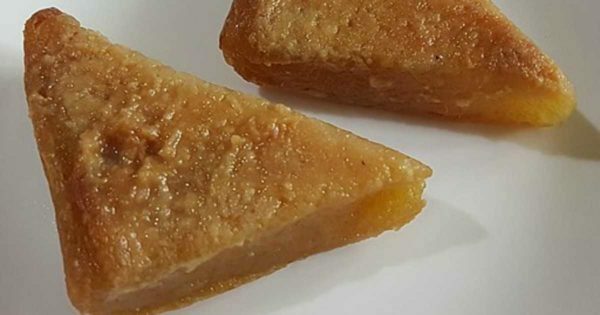 It is a popular snack among Filipinos since its main ingredient, cassava or kamoteng kahoy, is readily available in almost any part of the Philippines. Indeed, many Filipinos venture in Cassava Cake business as the cake is relatively easy to make and can be sold in an affordable price. Moreover, it’s a favorite treat not just during meryenda time but also during parties for almost any occasion. Here’s a simple cassava cake recipe for your home-based food business. Combine the grated cassava, butter, 6 tablespoons cheddar cheese, 1/2 cup condensed milk, 1/2 cup evaporated milk, 14 tablespoons granulated white sugar and 2 eggs in a mixing bowl. Mix thoroughly. Add 2 cups of coconut milk to the batter and mix. Pour in the batter in a greased baking tray. Preheat the oven for 350 degrees Fahrenheit for 10 minutes. Put in the baking tray with batter then bake for 1 hour. Remove from the oven then set aside. Prepare the topping by combining flour and two tablespoons sugar in a heated saucepan. Add 1/2 cup condensed milk then mix thoroughly. Add 2 cups of coconut milk then stir constantly for 10 minutes. Add the toppings over the baked batter then spread evenly. Glaze the topping with the egg white using a basting brush. You can do this by dipping the brisk to separated egg white then brush it on the cassava cake. Broil the cassava cake in your oven until its color turns light brown. Top with extra grated cheese before serving.